This project was last Wednesday's tutorial on Splitcoast. 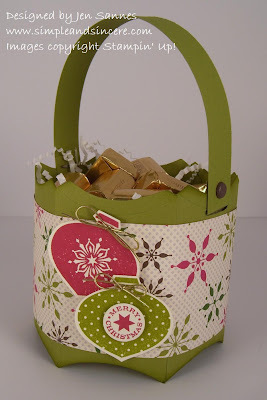 The tutorial author, Lynn Putt, made an adorable lil' pumpkin out of this bucket, but I decided to go Christmas! It's never too early to think about Christmas gifts, right? This was actually pretty quick to put together and it's nice and roomy - you can fit almost a whole bag of Hershey Nuggets inside (yum!). There would have been more in this picture, but I had to sample some and make sure they were edible. ;) You can view the entire tutorial here. much! I love your card designs!